Leading Manufacturer of air cooled scroll chiller from Mumbai. Air-cooled chillers actively absorb heat from process water; they then transfer this heat into the air around the chiller unit. This type of unit is typically used in areas where additional heat discharge is not an issue, but instead works as a benefit. For instance, the additional heat can be used to warm a space during the winter for less money than traditional heating systems. The cycle starts with the evaporator, which has a liquid refrigerant that flows over the evaporator tube bundle where it evaporates. In the process, heat is absorbed from the chilled water circulating through the bundle. The compressor then pulls the refrigerant vapor from the evaporator. The compressor is then tasked with pumping the refrigerant vapor to the condenser, which increases temperature and pressure. The refrigerant condenses when it’s in the condenser tubes, releasing its internal heat to the air o The high-pressure liquid then moves through the expansion device and into the evaporator; in the process the refrigerant pressure is reduced along with the temperature. 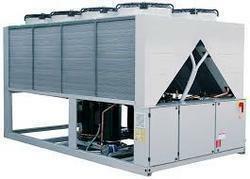 To complete the continuous cycle, the refrigerant flows back over the chilled water coils and absorbs more heat.